**** Important Post Vacation Note – Since my last pre-vacation note (July 16th) gold took a really big hit. The S&P was not so bad as the levels are near the last exit. I became concerned that the latest model modification (V 2.0) is not active enough to keep us out of protracted adverse moves. I am adding modifications to speed up the signals resulting in V2S (the “S” stands for speedy) nonlinear trading model to help this out. Part of this week’s comments theme regards moving the previous signals into sync with the modified model. Model Portfolios: Gold = Flat/exit long 7/27 (formerly bullish 6/04), S&P 500= Buys 7/27 (was flat from 6/09), VIX= Sells 7/27 (finally!). Gold: Just to state the obvious, the recent gold call was terrible. The model V2S is flat. So to transition to the new signal is simple: the gold model portfolio moves to flat. Maybe a new entry signal near the end of the week? Chinese weakness is fanning the fear that a wave of deflation awaits the world in general and commodities in specific. S&P 500: The S&P 500 fell back last week and is now near the low end of the range. The level is lower than the exit short close from the earlier signal. Model V2S indicates little downside and the monthly chart is in agreement. So is the VIX model. The S&P 500 portfolio is now bullish. $VIX (S&P volatility): The V2S model sold today, indicating that the pop-up is likely to not have the juice to push higher. One interesting thing is that the model is squarely in agreement (remember the inverse relationship between the VIX and the $S&P) with the S&P 500 readings. Previously they weren’t quite on the same page. Note: Technical comments are based on interpretations of non-linear trading models, combined with chart price action. Currency Trading Signals. I am now offering a similar Mummy process for currencies. This service will involve two signal paths, one on the US dollar and the other on a user selected second currency (1+1).The fee will be the same as the Bond trading signals. **** Important – I will be out of the office next week, no posts July 20 – 25! Model Portfolios: Gold = Bullish 6/04, S&P 500= flat 6/09, VIX= waiting for new entry. Gold: Gold continues to grind lower. Today’s price action dipper below the 110 level. I don’t expect it to stay this low, we should see a modest rally from this level. The gold model portfolio is long. S&P 500: The S&P 500 is now at the top end of the range. I expect some selling to come in at these levels but there is a twist. The VIX readings are very neutral. Taken at face values, the large-cap index should give back some of the week’s gains but not retest the 2040 level. The S&P 500 portfolio is flat. $VIX (S&P volatility): Pre-production VIX is flat, thus indicating limited downside for stoacks. I am waiting for a VIX signal (post 2.0). Gold: Gold hit a low, intra day on July 7th (GLD basis) and has proceeded with a rally on the following days. Technically, this indicates the sellers are running out of ammo. The gold model portfolio is long (and out of the money on the current signal), but the downside momentum is moderating. S&P 500: The largecap trend is dead (flat). Earlier, I had tenuous indications (mainly from pre-production Vix) that the next pop would be bullish. Now $VIX is flat also. The closing price on the S&P is about 5 points from our exit short level. The last 4 days have been a series of gyrations leading nowhere. The S&P 500 portfolio is flat. $VIX (S&P volatility): As mentioned above the pre-production VIX model is flat (neutral) So, I am waiting for an entry signal. What is the watch phrase? Keep your powder dry. Gold: Gold dropped below near-term support at approximately the 112 -112.50 (GLD basis) level. Nonlinear trading signals had anticipated the support to hold here. 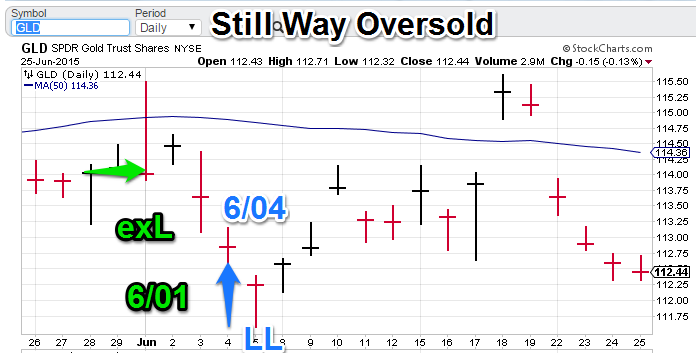 continues to press lower, possibly hunting for stops below the June 5th Now what? GLD did pick up some buy intraday and managed to close near the high of the trading range. Additionally the yellow metal is now fairly oversold. Making a move now is probably not a good idea. The model Gold portfolio is still long. 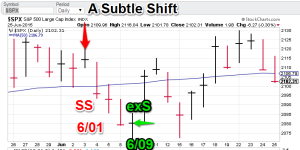 S&P 500: The line (loosely) goes ‘much sound and fury, signifying nothing.’ The S&P dive on the 29th and the muscular turn around today puts the blue-chip index at approximately the same level as our last go-to-flat signal on June 9th. VIX readings suggest the next major move will be up (or flat) but I cannot get nonlinear signal confirmation of that for the stock index itself. The S&P 500 model is still flat. $VIX (S&P volatility): The preproduction VIX signaled a short (bullish for stocks) as a result of June 29th The recent volatility in equities is not sending the mathematical index to new highs. I am waiting for a new (real-time) signal to start posting a chart on this. Model Gold Portfolios: Gold = Bullish 6/04, S&P 500= flat 6/09, VIX= waiting for entry. Gold: Gold continues to press lower, possibly hunting for stops below the June 5th low. 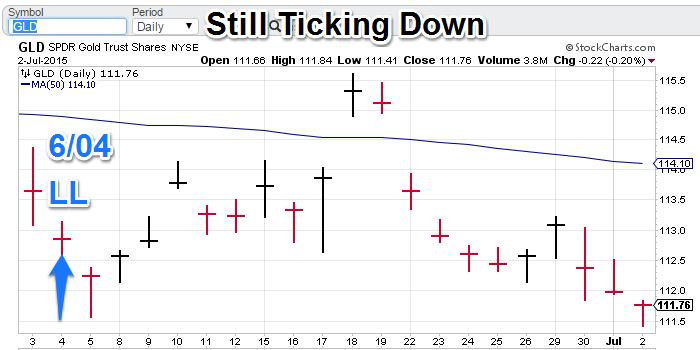 The GLD fund closed well off its intraday nadir (a possible sign of an upcoming reversal). Nonlinear trading analysis does not suggest the fund will be able to punch significantly below the 112 support level. The model Gold portfolio is still bullish. S&P 500: The 43 point loss in the aftermath of Greek-referendum announcement, seems to have marked the low level in recent trading. There is a hint of bullishness in the air but I can’t confirm it yet. The S&P 500 model is still flat. $VIX (S&P volatility): The preproduction VIX signaled a short (bullish for stocks) recently. I will be posting VIX trading signals on the next entry (I want to start with a ‘live’ signal for the beta test. I have to cycle through an exit to get to the next entry. Model Gold Portfolios: Gold = Bullish 6/04, S&P 500= flat 6/09, VIX= designing model. Gold: The surprise call for a Greek referendum to (in a de facto way) settle the matter of the Greek-Euro question absolutely staggered the markets on Monday. Gold reacted positively but not enough. We expect to see further advances. Our last signal was bullish and the current price levels are not overbought. The model Gold portfolio is still bullish. S&P 500: Whereas gold did not react enough, large-caps probably reacted too much. The 43 pt loss in the S&P 500 drubbing has put this index in oversold territory. US equities may come to be a type of safe-haven depending on European volatility. The S&P 500 model is still flat. $VIX (S&P volatility): The pre-production VIX trading model bounced quite a bit in recent days. Currently, this index is way overbought. Again the read is generally opposite the S&P 500 itself. Gold: Greek-Euro negotiation euphoria set sail on the back of the nitty gritty details of the deal, but gold continues to tick lower. 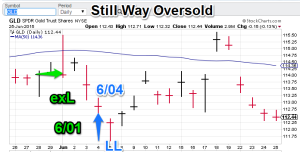 Nonlinear trading analysis still has this oversold. 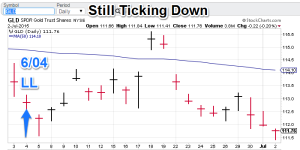 The selling over last two trading days features decreasing downside momentum (sometimes a precursor to a reversal). Longer-term analysis is also constructive. We are in a buying zone. The model Gold portfolio is still bullish. S&P 500: Large-caps were less sanguine about the downgrade of a positive Greek-Euro deal. The S&P sold off mildly to the middle of the recent trading range. Nonlinear trading analysis is beginning to hint (not yet confirm) that blue chips won’t have the energy to move lower than the recent bottom (2075 ,SPX basis). 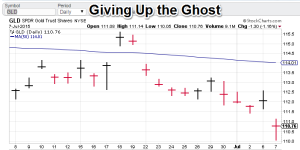 So the best approach is to give stocks a couple more days to bottom and see if a buy could be in the offing. The S&P 500 model is still flat. $VIX (S&P volatility): The pre-production VIX trading model has also suggested limited upside (though an upside retest of 15.75 on the $VIX is not impossible). The basic move here is opposite the S&P 500 strategy. S&P 500: Largecaps, laboriously, ticked higher on the Greek-feel-good news but the S&P closed about where it did last Thursday (June 18th). Maybe the good-times are still to come. The current read is still that we are range-bound. Recent trading activity has us hovering near the top end of the range. Translation: ‘be careful about buying here.’ The S&P 500 model is still flat. $VIX (S&P volatility): Largecap price compression is the opposite of healthy for volatility. The preproduction VIX trading model exited a useful short (it is now flat) but the index still moved lower. There is no indication of an upside reversal yet. S&P 500: Largecaps jumped today as well. However our system has not generated a buy yet. Our preproduction VIX signal did generate a sell (VIX tends to be inverse to the underlying market) recently so the theme for this market is a trading range with the top being 2135. The S&P 500 model is still flat. (note: the official signal for 6/9 was “exit Short” not “exit Long”, both are flat signals but we were short previous to the 9th). $VIX (S&P volatility): The preproduction VIX trading model is now negative (VIX sure moves fast). So taken with the S&P flat signal, this indicates we can expect largecaps to be rangebound for now.